We are very excited to bring to you Stage & Color — our newest enhancement to LASS. 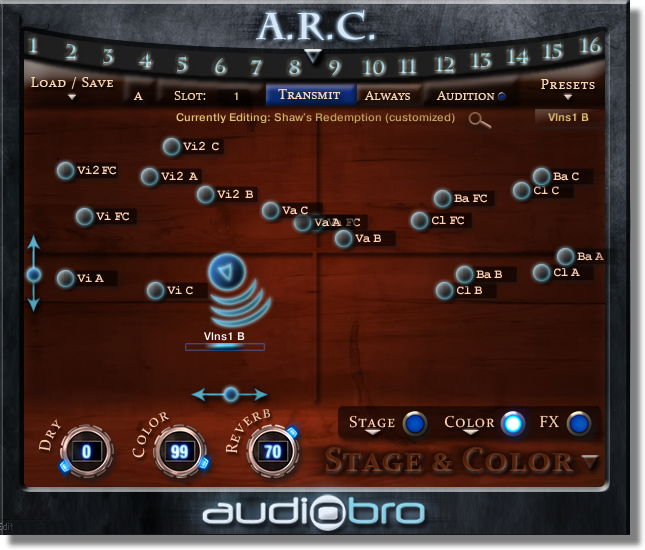 The Stage & Color page of the ARC lets you control some exciting new features in LASS ranging from the actual tone of the instruments to their stage placement and reverb all from a single page! We have carefully created sonic profiles inspired by famous film scores and performances that allow LASS to sound very close to the original recordings. In addition, Stage & Color enables you to individually move LASS’s instruments on the stage and change their position and perspective while maintaining realistic acoustic consequences of these changes. It is a very powerful tool that breathes new life into LASS. At the heart of Stage & Color is a collection of our new orchestral sound profiles (colors) inspired by famous orchestral recordings, movie scores and soloist recordings. These profiles are located in the Presets menu at the top right of the Stage and Color page. These exclusive sound profiles were created internally at Audiobro with a lot of love and care. It is our intention to release new profiles over time to keep LASS fresh and exciting… so the entries above may change and grow with time.